We previously reported that neuroimmune semaphorin (Sema) 4A regulates the severity of experimental allergic asthma and increases regulatory T (Treg) cell numbers in vivo; however, the mechanisms of Sema4A action remain unknown. It was also reported that Sema4A controls murine Treg cell function and survival acting through neuropilin 1 (NRP-1) receptor. To clarify Sema4A action on human T cells, we employed T cell lines (HuT78 and HuT102), human PBMCs, and CD4+ T cells in phenotypic and functional assays. We found that HuT78 demonstrated a T effector–like phenotype (CD4+CD25lowFoxp3−), whereas HuT102 expressed a Treg-like phenotype (CD4+CD25hi Foxp3+). Neither cell line expressed NRP-1. HuT102 cells expressed Sema4A counter receptor Plexin B1, whereas HuT78 cells were Sema4A+. All human peripheral blood CD4+ T cells, including Treg cells, expressed PlexinB1 and lacked both NRP-1 and -2. However, NRP-1 and Sema4A were detected on CD3negativeCD4intermediate human monocytes. Culture of HuT cells with soluble Sema4A led to an upregulation of CD25 and Foxp3 markers on HuT102 cells. Addition of Sema4A increased the relative numbers of CD4+CD25+Foxp3+ cells in PBMCs and CD4+ T cells, which were NRP-1negative but PlexinB1+, suggesting the role of this receptor in Treg cell stability. The inclusion of anti-PlexinB1 blocking Ab in cultures before recombinant Sema4A addition significantly decreased Treg cell numbers as compared with cultures with recombinant Sema4A alone. Sema4A was as effective as TGF-β in inducible Treg cell induction from CD4+CD25depleted cells but did not enhance Treg cell suppressive activity in vitro. These results suggest strategies for the development of new Sema4A-based therapeutic measures to combat allergic inflammatory diseases. Asthma is a complex multigenetic and multifactorial disease displaying various forms of severity (1, 2). The allergic form of this disease is considered to be initiated and driven by Th2-type of cells and cytokines (1–4). Allergy is a major predisposing factor for asthma development in allergen-sensitive, genetically predisposed individuals (1–4). The disease is characterized by shortness of breath, wheeze, cough, reduced airflow on expiration, and airway hyperresponsiveness to nonspecific bronchoconstrictors (1–4). The complex mechanisms of asthma initiation and progression have been extensively studied for several decades, and many research discoveries have been used in the pre- and clinical settings as therapeutic agents for disease immunotherapy (5–9). Despite these significant advances in research and therapy, the increase in asthma rates is a worldwide phenomenon and no cure for the disease is currently available (10). Regulatory T (Treg) cells present a special interest for a potential cellular therapy of allergic asthma, as they directly and specifically suppress effector Th2 cells thus lowering or even abrogating the allergen sensitization-induced tissue effects (6, 11–13). The surface and intracellular markers of Treg cells are currently well defined (11–14), which permits their isolation and in vitro expansion for the subsequent use in immunotherapy (15, 16). The Foxp3 molecule, which determines the Treg cell lineage commitment, has been a main focus in Treg cell detection and characterization. The regulation of this molecule expression by different factors plays an important role in Treg cell differentiation, expansion, and their ability to perform suppressive activity (11–17). Studies in murine models have shown that one of the members of the neuroimmune semaphorin (Sema) family proteins, Sema4A, critically regulates the stability and function of mouse Treg cells (17, 18). Delgoffe (17) showed that the immune cell–expressed Sema4A functionally interacts with one of its receptors, namely neuropilin 1 (NRP-1), on Treg cells, and this ligand-receptor interaction enhanced Foxp3 expression and Treg cell suppressive function. More recently, Lynch and colleagues (18) demonstrated that plasmacytoid dendritic cells (pDC) serve as a source of Sema4A in lung inflammatory diseases. In vivo pDC depletion prevented the expansion of NRP1+ Treg cells, thus leading to severe Pneumovirus-induced bronchiolitis and subsequent asthma susceptibility. These findings supported the Sema4A source in mouse cancer models where pDC comprised the majority of Sema4A-expressing tumor-infiltrating cells (17). Thus, both studies showed that mouse NRP-1+Treg cells require Sema4A provided by other immune cells to effectively perform their regulatory function. We previously investigated the roles of two neuroimmune Sema, Sema4A and Sema4D, in allergic asthma in vivo. We demonstrated that these two distinct members of the class IV Sema family of proteins display opposite effects on asthma severity (19, 20). Sema4A−/− mice exhibited an exacerbated response to allergen challenge that included increases in eosinophilic airway infiltration, lung local Th2 cytokine secretion, bronchial epithelial cell hyperplasia, airway hyperresponsiveness to methacholine challenges, and allergen-specific Ab content in serum (19). In contrast, Sema4D−/− mice demonstrated reduced allergic lung inflammatory cell infiltration, lung Th2 and proinflammatory cytokine contents, and humoral anti-allergen responses (20). The exacerbated inflammatory lung response in Sema4A−/− mice was accompanied by the significantly lower numbers of Treg cells in spleens and lungs, whereas this was the opposite for Sema4D−/− mice (19, 20). Treatment of Sema4A−/− mice with recombinant Sema4A (rSema4A) resulted in not only significantly reduced allergic airway responses but also increased numbers of lung Treg cells (21). All these observations suggested the existence of a positive feedback loop between Sema4A and Treg cells that controls the allergic inflammatory response. Currently, the mechanism(s) by which Sema4A regulates Treg cell function in allergic asthma is unclear. One of the seven existing Sema4A receptors, namely Tim-2, has been shown to be expressed on mouse Th1 cells and critically regulate Th2 response in experimental asthma settings (21–23). However, a human Tim-2 homolog has not yet been identified (24). Similarly, although expression of another cell surface receptor for Sema4A, NRP-1, has been detected on mouse Treg cells (17), human Treg cells have not been shown to express NRP-1. Therefore, we sought to define the receptor for Sema4A on human Treg cells that could potentially regulate the Treg cell–mediated suppression of human allergic airway inflammatory responses. For this purpose, we studied the HuT78 and HuT102 cell lines and primary human PBMCs for staining with specific Abs to Treg cell surface and intracellular molecules and subsequent flow cytometry analysis. It has been shown previously that HuT78 and HuT102 cells display a mature Th phenotype expressing CD3 (25, 26) and CD4 molecules (26) and secreting a variety of proinflammatory and Th-type cytokines (27). One of these cell lines, HuT102, was previously shown to express the Treg cell marker Foxp3 (28). We have found that rSema4A increases HuT cell survival in culture and stabilizes the Treg cell–like phenotype of HuT102 cells. We also observed Treg cell–stabilizing functions of rSema4A for HuT CD4+ cells and human PBMC–derived Treg cell. We further show evidence that Plexin B1 is expressed on human T cells and Treg cells. It functions as a critical Sema4A receptor on human Treg cells that contributes to Sema4A-induced Treg cell stability and survival. Further studies defining the Sema4A effects on other cell lines and primary cells and the molecular mechanisms of anti-apoptotic Sema4A action are necessary to confirm a potential for rSema4A as a therapeutic agent for asthma and other chronic inflammatory diseases. HuT78 and HuT102 cell lines were purchased from the American Type Culture Collection (ATCC) (ATCC CRMTIB161 and ATCC TIB162, respectively). The authenticity of both cell lines was validated by the Biopolymer Genomics Core Laboratory at the University of Maryland School of Medicine by short tandem repeat typing using the Promega Geneprint 10 system. These cell lines were generously provided by Dr. A. Banerjee’s laboratory and maintained in complete RPMI (cRPMI) (RPMI-1640 [Lonza]), 10% heat-inactivated FBS (Atlanta Biologicals), 5% l-glutamine (Lonza), 5% sodium pyruvate (Lonza), 5% penicillin-streptomycin (17-609E; Lonza), 5% Eagle’s MEM–nonessential amino acids (Life Technologies), HEPES buffer (1M, Sigma), 2 μl of 2-ME/100 ml of media) for cell growth and passages between the cell harvest and flow cytometric analyses. Three sources of PBMCs were used in the experiments. Human blood samples were obtained from healthy volunteers (Dr. Golding’s Institutional Review Board protocol HP-00052083) or purchased from STEMCELL Technologies (Tukwila, WA), and PBMCs were isolated by gradient centrifugation using endotoxin-free Ficoll-Paque (GE Healthcare). The freshly isolated PBMCs were also generously provided by the laboratory of Dr. S. Strome (Department of Otorhinolaryngology, Head and Neck Surgery, University of Maryland School of Medicine). HuT78 and HuT102 cells were cultured with or without lysis buffer to determine the spontaneous and maximum lactate dehydrogenase (LDH) activity using Pierce LDH Cytotoxicity Assay Kit (Thermo Fisher Scientific, Rockford, IL) according to the manufacturer’s instructions. The positive LDH control, cRPMI, and serum-free RPMI controls were included into assays. The selected reagent’s cytotoxicity was measured using the kit mentioned above according to the manufacturer’s protocol of a Chemical Compound–Mediated Cytotoxicity Assay. HuT78 and HuT102 cells and PBMCs were placed in 24-well tissue culture plates (1 × 106 cells per well) and incubated in a standard tissue incubator (Thermo Fisher Scientific) with 5% CO2 at 37°C with either medium alone (cRPMI), human rSema4A protein [100 ng or 1 μg, Abnova), anti-PlexinB1 Ab (20 μg/ml, clone EC-6.9 (29)], ultra-LEAF purified mouse IgG1 (20 μg/ml; clone MOPC-21, BioLegend), or a combination thereof. Where necessary, PBMCs were pretreated with anti-PlexinB1 Ab for the first 30 min of culture, and then the mentioned above recombinant proteins were applied. In separate experiments, CD4+ T cells were isolated from PBMCs by negative selection using EasySep Human CD4+ T Cell Enrichment Kit (STEMCELL Technologies) and cultured in vitro with either rSema4A or mIgG1 in cRPMI. Cells were harvested 48 h later, and cell culture supernatants were collected and stored at −80°C for further analysis. For the following experimental settings, PBMCs were isolated from Human Whole Peripheral Blood Collected with EDTA (STEMCELL Technologies). CD4+ T cells were obtained from PBMCs by negative selection as described above and depleted of natural Treg cells using CD25 MicroBeads II (Miltenyi Biotec) and cell separation magnet (STEMCELL Technologies). CD4+CD25depleted cells were seeded (130,000 cells per well) into U-bottom 96-well tissue culture plates (Costar) stimulated with 5 μg/ml of plate-bound anti-CD3 Ab (OKT3, BioLegend), 1 μg/ml soluble anti-CD28 Ab (BioLegend), and cocultured with cRPMI alone, recombinant human (rh)IL-2 (100 IU/ml; Peprotech), rhTGF-β (5 ng/ml; R&D Systems), or both, in the presence or absence of rhSema4A (100 ng/ml). CD4+CD25depleted cells were harvested 6 d later, and live cells were analyzed by flow cytometry for CD3, CD4, CD25, and Foxp3 marker expression using the commercial Abs listed in the flow cytometry section. CD4+CD25enriched T cells were obtained from PBMCs by isolation of CD4+ cells using a negative selection starting with human CD4+ T cell enrichment mixture (EasySep kit; STEMCELL Technologies) followed by CD25 enrichment with CD25 MicroBeads II and MS column (Miltenyi Biotec). CD4+CD25enriched cells were seeded (400,000 cells per well) into 48-well tissue culture plates (Falcon, Becton Dickinson Labware) and cocultured with rhSema4A (100 ng/ml) with or without rhIL-2 (100 IU/ml). Cell were harvested 48 h later and analyzed by flow cytometry for CD3, CD4, CD25, and Foxp3 marker expression on live cells using the commercial Abs listed in the next section. In Treg cell suppression assay, isolated CD4+CD25+CD127low Treg cells (500,000 cells per ml) and CFSE-labeled CD4+CD25− T responder (Tresp) cells (500,000 cells per ml) were cocultured in regressive proportion (Treg cell:Tresp cell; 1:1, 1:3, and 1:9) in 96-well U-bottom plates (Costar) in final 100,000 cells per well concentration with or without rhSema4A (100 ng/ml) for 3 d. CD4+CD25+CD127low Treg cells were obtained from human blood cells isolated over Ficoll (GE Healthcare) PBMC incubation with CD25 positive selection mixture followed by CD4 T cell enrichment mixture and followed by CD127high depletion mixture (all are the components of EasySep Human CD4+ CD127lowCD25+ Regulatory T cell Isolation Kit from STEMCELL Technologies) with the use of rapid spheres in between sets and dextran spheres at the final step of cell isolation process to discard the magnetic and dextran beads. All cell isolation steps were performed according to the kit manufacturer’s protocol. CFSE labeling of Tresp cells was done using CellTrace CFSE Cell Proliferation Kit (Invitrogen) according to the manufacturer’s protocol. Cells were cultured in ImmunoCult-XF T cell Expansion Medium and stimulated with 2.5 μl/well of ImmunoCult Human CD3/CD28 T Cell Activator (both from STEMCELL Technologies). Percent suppression of Tresp cell proliferation for each Treg cell dose was calculated using a conventional method where [100 − (% divided Tresp cells cultured alone/% divided Tresp cells in cultures with Treg cells) × 100] = % suppression (30). The purity of isolated cell before the in vitro cultures was assayed by flow cytometry for all described above settings. Cells were harvested from cultures and washed and maintained in MACS buffer (Miltenyi Biotech) during the experiments. Cells were stained with viability marker according to the manufacturer’s instructions (Thermo Fisher Scientific LIVE/DEAD Fixable Aqua Dead Cell Stain Kit) followed by incubation with an Fc block (BD Pharmingen) and, afterward, specific Abs to the corresponding extracellular markers such as CD3-FITC, CD4-PE-Cy7, NRP-1–allophycocyanin, Sema4A-PE, Helios-PE (all from BioLegend), and CD25-allophycocyanin (eBioscience) were applied. To stain for intracellular markers, the Foxp3 /Transcription Factor Staining Buffer Set (eBiosciences) was used for cell fixation and permeabilization according to the manufacturer’s instructions followed by an incubation with Foxp3–eFluor 450 and Helios-PE or -PacificBlue (all from BioLegend) Abs. Appropriate isotype control Abs (mouse IgG1–PE, mouse IgG2a–allophycocyanin, hamster IgG–PacificBlue (all three from BioLegend), mouse IgG1–eFluor 450 (eBioscience) were used in separate experimental tubes together with selected cell surface markers with noninterfering fluorochrome labels. For Plexin B1 visualization by flow cytometry, mouse anti-PlexinB1 Ab (clone EC-6.9) was combined with PE-Cy7 anti-mouse IgG2a Ab (eBioscience) in a two-step staining procedure with a 1 h incubation time for each step. Two-step staining procedure was also used for NRP-2 detection on cell surface where a NRP-2 mAb served as a primary Ab (or mouse monoclonal IgG2b Ab as an isotype control) and goat anti-mouse IgG-allophycocyanin as a secondary Ab (all three from R&D Systems). After a final wash, cells placed in MACS buffer were acquired and analyzed with the BD LSRFortessa flow cytometer. FlowJo software was used for the live cell gating and their further analysis. PBMC culture supernatants were collected and kept frozen at −80°C until assayed for the IL-2 content in sandwich ELISA at the Cytokine Core Laboratory of the Center for Innovative Biomedical Resources at the University of Maryland School of Medicine. The statistical differences between different experimental settings were determined according to Prism 7.03 (GraphPad) software’s Student paired t test. Data are shown as means of relative numbers of corresponding cells ± SEMs for normally distributed data sets. At the p < 0.05 level, the comparing data sets were considered to be statistically significant. To analyze the cell surface and intracellular marker expression on HuT cells, we performed seven-color flow cytometry and sequential data analysis. After exclusion of dead cells based on their AmCyan positivity, we analyzed CD3, CD4, and CD25 marker expression on the cell surface, as both cell lines were previously characterized as mature Th cells (27). Both cell lines were found to be CD4-positive; however, they differed in expression of other markers (Fig. 1). HuT78 cells were Sema4A+ and Helios+ but lacked expressions of CD25 and Foxp3. HuT78 cells demonstrated low levels of the Sema4A receptor Plexin B1 but lacked NRP-1. In contrast, HuT102 cells were Sema4Alow and Helios+ and expressed CD25 and Foxp3. HuT102 cells expressed Plexin B1 and lacked NRP-1. These differences were consistent and significant. HuT102 cells, in comparison with HuT78 cells, lacked Foxp3 (1.7 ± 0.2% versus 36.1 ± 1.6%, p < 0.001) expression but were Helios+ (77.4 ± 4.1% versus 35.8 ± 1.5%, p < 0.003) (Fig. 1). CD25 expression also differed between these cell lines (relative numbers of CD25+ cells amounted to 17.7 ± 1.1% versus 35.6 ± 2.1%, HuT78 versus HuT102 cells, correspondingly, p < 0.0025). High Sema4A expression on HuT78 cells (91.1 ± 0.4%) was associated with low PlexinB1 (19.4 ± 1.2%) levels, whereas this was the opposite for HuT102 cells (from 5.0 ± 1.2% and 72.4 ± 2.1%, correspondingly, p < 0.00015 and 0.00035, corresponding values difference between HuT78 and HuT102 cell lines). Foxp3+ HuT102 cells coexpressed Helios and Sema4A (35.8 ± 1.4% and 32.4 ± 3.2%, correspondingly). Both cell lines were negative for NRP-1. Therefore, similar to what was reported previously (28), the HuT102 cell line displays a Treg cell–like phenotype (CD4+CD25+Foxp3+), although the percent positivity varied during cell culture. Depending on the cell cycle during harvest, Foxp3 expression in HuT102 cells can reach up to 55%. CD25 expression on both cell lines also varied from assay to assay, ranging from 1.1 ± 0.5% (Fig. 1A) to 17.7 ± 1.1% to 32.8 ± 0.5% for HuT78 cells and from 21.5 ± 0.2 (Fig. 1A) to 35.6 ± 2.1% to 90.7 ± 0.1% for HuT102 cells. These results may suggest that HuT102 cells display phenotypic characteristics of ex-thymically derived Treg cells. However, it has been previously shown that another marker of thymic origin Treg cells, Treg cell–specific demethylated region of FOXP3, is not present in HuT102 cells (31). Therefore, although HuT102 cells express CD25 and Foxp3, the relatively low Helios expression and lack of Treg cell–specific demethylated region may suggest that they are more reminiscent of peripherally induced Treg cells (32). Variable levels of cell surface and intracellular marker expression by HuT78 and HuT102 cells. (A) Hut78 and (B) HuT102 cells were maintained in cRPMI until harvest followed by staining for flow cytometry assay using specific Abs for the indicated cell surface and intracellular markers. Dead cells were eliminated from analysis based on their loss of membrane integrity and, thus, inclusion of a dead cell dye. The data shown represent live HuT cells on dot plots and histograms. On histograms, the levels of specific marker’s expression are shown in black line with transparent background, whereas an individual for each marker isotype control Ab stain is shown in solid gray color. The flow cytometry analysis data of one out of three experiments are shown. To identify Plexin B1–expressing cells among PBMCs, we performed flow cytometry with sequential gating analysis (Fig. 2A). Dead cells were excluded using live/dead staining. We found that around 70% of total viable human PBMCs expressed Plexin B1, and the majority (over 90%) of Plexin B1–positive cells were CD3+ T cells. Essentially all CD3+ T cells expressed Plexin B1, and none of them expressed NRP-1. We also observed on CD3 versus PlexinB1 dot plots that two CD3-negative populations of cells express intermediate (intermed) to low levels of Plexin B1 (Fig. 2A). Human Treg cells express PlexinB1. Human PBMCs were obtained from healthy donors and stained with specific Abs for the indicated cell surface and intracellular markers. Dead cells were eliminated from analysis based on fixable dye exclusion. 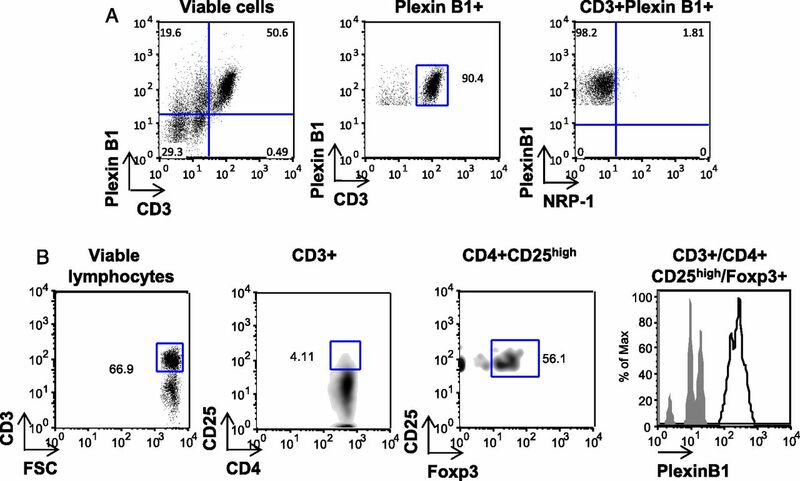 (A) Human CD3+ cells express Plexin B1 but not NRP-1. (B) Representative dot and density plots are labeled with the gating strategies. Histogram of PlexinB1 staining for CD4+CD25highFoxp3+ cells is shown. Marker-specific staining is shown by the black line with a transparent background, whereas an isotype control Ab staining is shown in solid gray color. Data are representative from three different experiments. It has been reported previously that mouse Treg cells do not express Sema4A (17). However, they express NRP-1, and Sema4A–NRP-1 interaction was reported to play a role in mouse Treg cell stability and function (17, 18). As human Treg cells lack NRP-1 (33), and Treg cell–like HuT102 cells express Plexin B1, we examined whether primary human Treg cells are Plexin B1+. Viable CD3+ cells were regated on CD4 and CD25 marker expression, and then CD3+CD4+CD25high cell population was examined for Foxp3 expression (Fig. 2B). We then examined the expression of Plexin B1 on human Treg cells specifically. This approach identified that all CD3+CD4+CD25highFoxp3+ cells express high levels of Plexin B1. In contrast to HuT78 cell line, HuT102 cell line is known to expand slowly with varied degrees of overall viability (34). Nevertheless, the effects of different inhibitors on these leukemic cell line’s viability and proliferation have been extensively evaluated in vitro to identify the novel therapeutic agents for patients with cutaneous T cell lymphomas (35–38). We examined the effect of exogenous rSema4A protein on HuT cell lines. After 48 h of in vitro culture with rSema4A, the cells were harvested, stained, and analyzed by flow cytometry to analyze the cell viability. Exogenous Sema4A modestly enhanced HuT cell survival in culture (Fig. 3). A low dose of rSema4A (100 ng) was sufficient to increase HuT78 cell survival by 14%, whereas for HuT102 cells the viability increased by 10% as compared with that measured in cells cultured with medium alone, and a higher dose further enhanced this effect. Exogenous Sema4A increases HuT cell survival. Live cells on flow cytometry dot plots were selected for further analysis based on dead cell dye exclusion. The graphical representation of the combined data from three independent in vitro cell culture experiments is shown. As the cell death in the 48 h in vitro cultures was relatively high, we examined their basal survival using the LDH release assay. Both HuT cell lines demonstrated spontaneous LDH release (OD490= 0.469 ± 0.002 and 0.477 ± 0.011 for 10,000 HuT78 and HuT102 cells, respectively). We then performed the analysis of a potential toxicity of the reagents used in the cell culture procedures. The results clearly show that none of the reagents used display a cytotoxic activity toward HuT cell lines (Supplemental Fig. 1). We further analyzed whether rSema4A affects the expression levels of T cell markers. We have found that rSema4A increased the relative numbers of CD25-expressing cells in both cell lines (Fig. 4A, 4B). The stimulatory effect of rSema4A appeared more potent on CD25low HuT78 cells, as the relative number of CD25+CD4+ cells increased from 6% in cultures with medium to 30% in cultures with 1 μg of rSema4A, although the staining intensity remained low. As the HuT102 cells were already CD25+, the stimulatory effect of rSema4A on CD25 expression on HuT102 cells was more modest (from 21.1 to 34.3%, cultures with medium and 1 μg of rSema4A, respectively). rSema4A increases the relative number of CD4+CD25+ HuT cells. Cells were cultured in vitro in cRPMI with or without rSema4A for 48 h. Cells were analyzed for CD25 expression (A and B). Live HuT cell dot plots (A) and histograms (B) show the levels of CD25 marker expression. 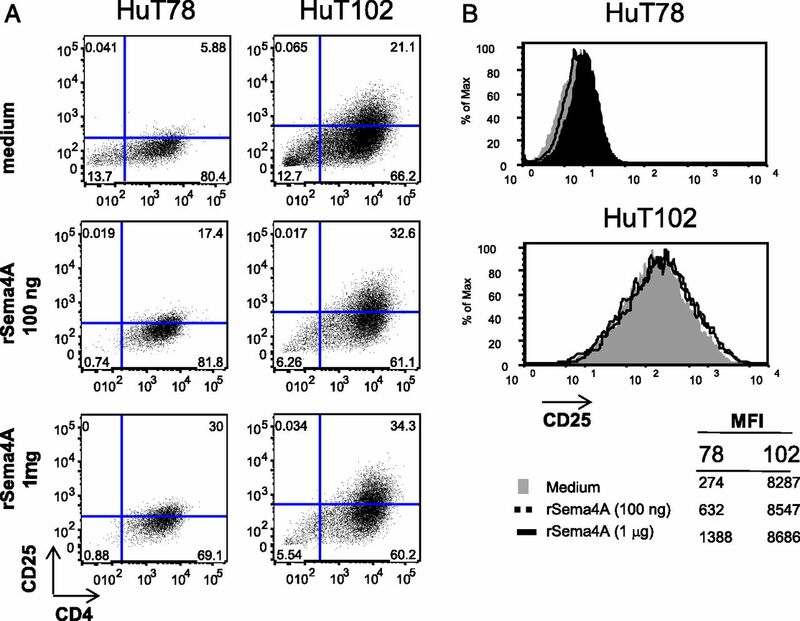 (B) Marker positivity on HuT cells in cultures with rSema4A is shown in black line with transparent background histograms or solid black color histogram (for 100 ng and 1 μg of rSema4A, correspondingly), whereas CD25 expression on cells cultured with medium alone is shown in solid gray color. It has been reported previously that Helios, but not Foxp3, is a marker for activated Treg cells (39). We show above that HuT78 T effector–like but not HuT102 Treg cell–like cells express high levels of Helios (Fig. 1A, 1B). Moreover, as Helios and Foxp3 were reported to be coexpressed and coregulated in human Treg cells (40), we next examine the effect of rSema4A on the expression of these two molecules in HuT cell lines. Surprisingly, Helios expression was further increased in Helioshigh HuT78 cells but not in Helioslow HuT102 cells (data not shown). This finding contrasted with Foxp3 expression pattern between the two cell lines (Fig. 5A, 5B). Foxp3 was not detected in HuT78 cells (Fig. 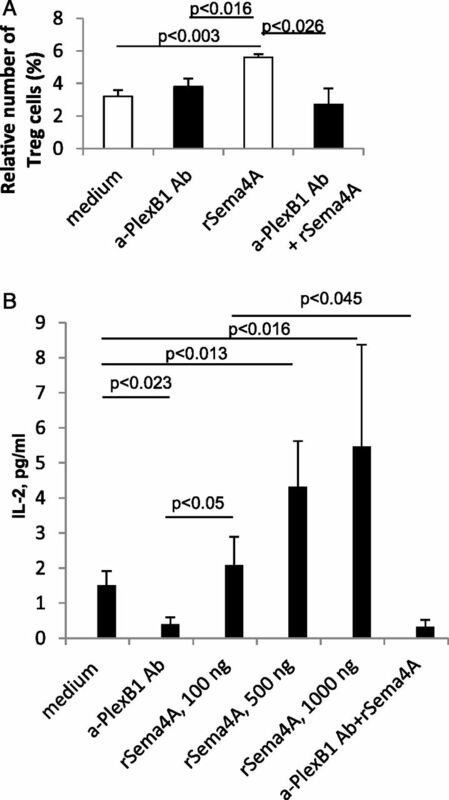 1A), and its absence was not affected by rSema4A exposure (Fig. 5A, 5B). Moreover, in HuT78 cells, Foxp3 was not associated with Helios expression. Further analysis of CD25 and Foxp3 coexpression study in HuT102 cell line demonstrated the increased yields of CD4+CD25+ and CD25+Foxp3+ cells with Sema4A exposure (Fig. 5A). These results suggest that Sema4A promotes HuT survival and potentiates HuT102 cell Treg cell phenotype. rSema4A increases yields of CD25+Foxp3+ cells in HuT102 but not in HuT78 cell line. HuT cells were cultured in cRPMI with or without rSema4A for 48 h. Harvested cells were stained for intracellular Foxp3. 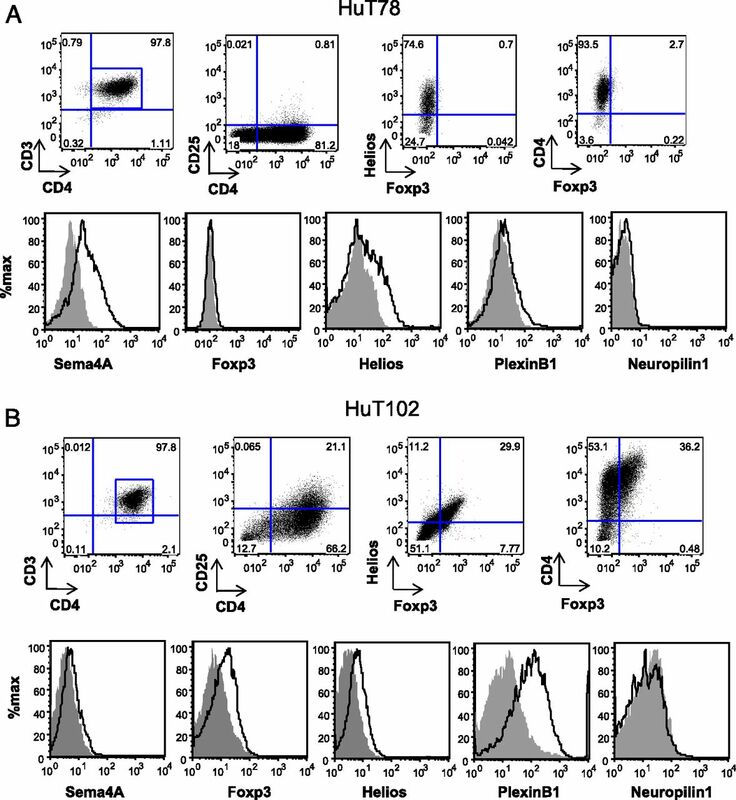 Expression levels of Foxp3 in CD4+ HuT cells are shown on corresponding CD25/Foxp3 and CD4/Foxp3 dot plots (A) and histograms (B), whereas the levels of Foxp3 in rSema4A-exposed cells shown in transparent colors overlay gray solid histograms representing Foxp3 stain in cells cultured without rSema4A. Data are representative from three different experiments. To determine if exogenous rSema4A has an effect on human peripheral blood Treg cells similar to what we observed for HuT cells, we established in vitro cultures of human PBMCs with the experimental settings as described above for the HuT cell lines. Sema4A exposure did not affect the cell survival in cultures as compared with cell cultures with medium alone and did not change the numbers of CD4+ T cells but slightly increased the number of CD4intermedCD3negative monocytes (8.78% of total PBMCs in cultures with medium versus 12% cells in cultures with 100 ng of rSema4A) (Fig. 6A; Supplemental Fig. 2). Moreover, rSema4A displayed a highly specific effect on Treg cells, as it increased the relative number of CD4+Foxp3+ cells among PBMCs from 3.9 ± 0.6% in cultures with medium to 6.2 ± 0.1% in cultures with 100 ng of rSema4A, and 6.6 ± 1.4% in cultures with 1 μg of rSema4A, p < 0.03 rSema4A versus medium (Fig. 6B, top row; Fig. 6C). Although the percentage of CD4+CD25+ T cells did not vary between the PBMC cultures with or without rSema4A, the relative number of CD4+CD25highFoxp3high Treg cells was potentiated by rSema4A ranging from 14.8 ± 1.9% in cultures with medium to 27.3 ± 1.9% with 100 ng of rSema4A (p < 0.045), 36.7 ± 2.3% with 1 μg of rSema4A (p < 0.04), and 17.7 ± 3.0% with control protein mIgG1 (Fig. 6B, middle row; Fig. 6C). These Treg cells were found to stain positively for Plexin B1 (Fig. 2). Of note, these Treg cells did not express NRP-1 (Fig. 6B, bottom row). Exposure to rSema4A increases Treg cell numbers in human PBMC in vitro cultures. Human PBMCs were cultured with or without external rSema4A for 48 h. Mouse IgG1 served as irrelevant protein control. After harvest, the numbers of CD4+ T cells and Treg cells were assessed by flow cytometry using specific Abs to corresponding cell surface and intracellular molecules. 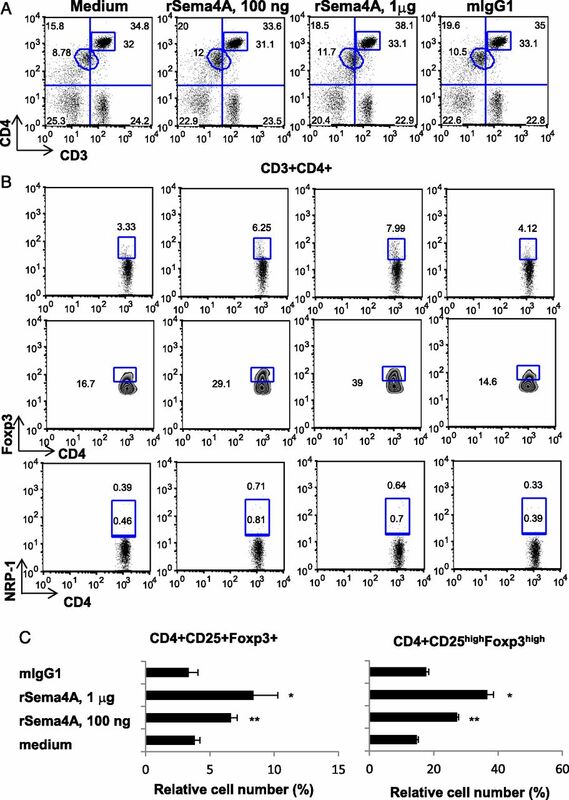 CD3+CD4high cells shown on upper panel dot plots (A) were further selected to evaluate the relative number of Treg cells in each in vitro experimental setting (B). The Foxp3high cells were gated on CD4+Foxp3+ dot plots. (C) CD25+ expression on CD4+Foxp3high Treg cells is depicted on the corresponding cell density plots, whereas NRP-1 expression (dot plots) is shown above. Data are representative from three independent experiments. *p < 0.04, **p < 0.045. Although human T cells were uniformly negative for NRP-1, we identified a population of NRP-1–expressing cells among CD4intermedCD3negative cells that were low to negative for CD25 expression but expressed Sema4A (Supplemental Fig. 3), demonstrating our ability to detect human NRP-1 on PBMCs. The expression of NRP-1 on these cells was further upregulated by Sema4A exposure. These cells did not express either Helios or Foxp3 (data not shown). Because the effects of Sema4A were observed in total PBMCs, and non–T cells also expressed Plexin B1, it was possible Sema4A enhanced Treg cell stability by an indirect manner. To determine whether Sema4A was acting directly on T cells, we isolated CD4+ T cells from PBMCs by negative selection. The CD4+ T cells were cultured with increasing doses of rSema4A for 48 h, and the numbers of CD4+CD25highFoxp3+ cells in cultures were assessed by flow cytometry. We observed a dose-dependent potentiation of Treg cell stability by external Sema4A (Fig. 7). Therefore, Sema4A enhances Treg cell stability by acting on CD4+ T cells. rSema4A potentiates Treg cells in CD4+ T cell cultures. CD4+ T cells were isolated from PBMCs by negative selection using a corresponding Ab kit and cell separation magnet obtained from STEMCELL Technologies. They were cultured in vitro with or without external rSema4A for 48 h. Then cells were harvested and assessed for the specific marker expression to detect Treg cells. The relative numbers of CD4+CD25+Foxp3+ Treg cells were selected on corresponding cell density plots in cell culture triplicates settings for each culture condition. Peripheral CD4+CD25− T cells can be induced to a Foxp3+ regulatory phenotype through the essential action of TGF-β (13, 14, 41). It is well established that the generation of an optimal number of Treg cells from CD4+CD25− T cells requires stimulation through TCR, IL-2R, and TGF-βR (13, 14, 41, 42). 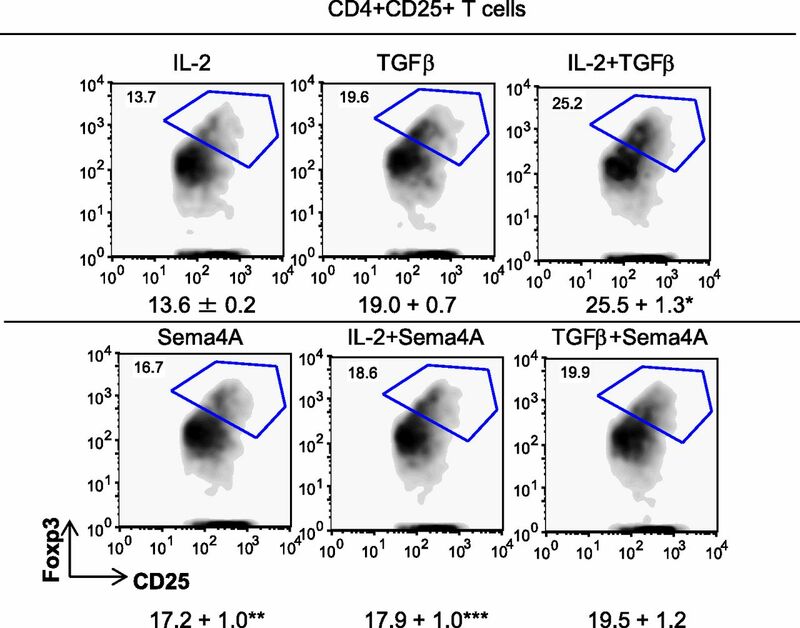 To determine if Sema4A influenced the generation of new Treg cells and if it potentiates the effect of a classical stimulation in Treg cell induction, we cultured human CD4+CD25depleted T cells with plate-bound anti-CD3 Ab and soluble anti-CD28 Ab in the presence of TGF-β or IL-2 or in combination with rSema4A (Fig. 8). The cells were harvested, and the relative numbers of CD4+CD25+Foxp3+ Treg cells were assessed by flow cytometry. The CD4+CD25depleted T cell stimulation with IL-2 alone in combination with TCR engagement and costimulation demonstrated 13.6% Foxp3+ cells among CD4+CD25+ cells, whereas TGF-β stimulation demonstrated 19% (Fig. 8). As expected, the most effective inducer of CD4+CD25+Foxp3+ cells was a combination of IL-2 plus TGF-β (25.5% of CD4+CD25+ cells were also Foxp3+). Interestingly, rSema4A addition to CD4+CD25depleted T cell cultures was as effective as TGF-β alone and even more effective than IL-2 stimulation. However, rSema4A did not act synergistically with either stimuli (Fig. 8). These results suggest that rSema4A has some modest potential to regulate the induction of inducible Treg (iTreg) cells. rSema4A induces iTreg cells in CD4+ T cell cultures. CD4+ T cells were isolated from PBMCs by negative selection as described in the legend to Fig. 7 and depleted of natural Treg cells using CD25 microbeads. CD4+CD25depleted cells were stimulated with plate-bound anti-CD3 Ab plus soluble anti-CD28 Ab and cultured for 6 d in cRPMI supplemented with IL-2 and/or TGF-β with or without rSema4A. The relative numbers of CD4+CD25+Foxp3+ T cells were assessed in three flow cytometry settings for each cell culture condition, and the corresponding statistics were evaluated. The median relative number of iTreg cells ± SEM in three culture settings is shown below each density plot. Note that rSema4A was equally efficient to TGF-β1 in iTreg cell induction. *p < 0.006, IL-2 + TGF-β versus either TGF-β or IL-2 alone. **p < 0.035, Sema4A versus IL-2. ***p < 0.02, IL-2 + Sema4A versus IL-2 alone. We next sought to determine if exogenous Sema4A has a direct phenotype-stabilizing effect on Treg cells in the in vitro cultures. A previously published study using mouse Treg cells showed the absence of such effect (17). It concluded that Sema4A expressed by CD4+ T cells bind NRP-1 on Treg cells to potentiate their survival and suppressive function, as NRP1-deficient Treg cells failed to suppress tumor growth and formation of lung metastases in mouse models of melanoma, adenocarcinoma, and thymoma. However, we showed that human Treg cells do not express NRP-1 but express Plexin B1 (Figs. 2B, 6B). Therefore, a direct Sema4A–Plexin B1 stimulation loop could be possible for human Treg cells. We isolated CD4+ cells from human PBMCs and enriched them for Treg cells by positive selection with CD25 microbeads. The Treg cells were then cocultured with either low (100 ng/ml) or high (1 μg/ml) dose of rSema4A or with IL-2 with or without a low dose of Sema4A (Fig. 9). We did not find any significant differences in Foxp3 expression in CD25+ cells in the presence or absence of rSema4A. Although exogenous IL-2 significantly potentiated the relative number of CD4+CD25+Foxp3+ Treg cells as expected, rSema4A did not stimulate any additional effects. These results suggest that the ability of rSema4A to enhance the percentage of Treg cells in total PBMCs or isolated CD4+ T cell populations may be via an indirect mechanism. rSema4A has no direct effect on Treg cells in the in vitro cultures. CD4+CD25enriched T cells (Treg cells) were isolated from PBMCs and cultured in vitro with increasing concentrations of rhSema4A with or without rhIL-2. Treg cell cultures with medium alone or medium supplemented rhIL-2 served as negative and positive controls for Sema4A-mediated Treg cell induction, correspondingly. To determine whether rSema4A may enhance human Treg cell suppressive activity, we cocultured Tresp cells and CD4+CD25+CD127low Treg cells in the presence or absence of rSema4A and analyzed Tresp cell proliferation by analyzing CFSE dilution (Fig. 10A, 10B). Treg cells suppressed the proliferative capacity of CFSE-labeled responder cells in a cell dose-dependent manner. Median percent suppression of Tresp cell proliferation for each Treg cell dose is shown in Fig. 10C. Sema4A addition to the Treg cell cultures did not enhance their suppressive activity. Rather, the addition of rSema4A abrogated the Treg cell suppressive activity, and the Tresp cells proliferated. In the absence of Treg cells, the rSema4A did not enhance the proliferative response of the CFSE-labeled responders. rSema4A does not enhance Treg cell suppressive activity in vitro. CD4+CD25depleted T cells (Tresp) cells were labeled with 5 μM CFSE and then stimulated with CD3/CD28 T cell activator when cocultured with decreasing numbers of CD4+CD25+CD127low Treg cells in the presence of rhSema4A. (A) shows representative CFSE histograms for Tresp cell proliferation where each cell division cycle is clearly distinguished. (B) shows various overlays of data for Tresp cell proliferation in triplicates of each culture setting from two experiments. (C) shows a median percent suppression of Tresp cell proliferation by Treg cells for each Treg cell:Tresp cell combination. *p < 0.035 for each of five cell generations, Tresp cell versus Treg cell:Tresp cell 1:1. ** and ***p < 0.05 for five cell generations, Treg cell:Tresp cell 1:1 and 1:9 versus Treg cell:Tresp cell 1:1 and 1:9 plus rSema4A. To determine if the rSema4A-induced effect on human Treg cells was mediated by Plexin B1, anti–Plexin B1–neutralizing Ab (a-PlexB1 Ab) was added to the PBMC cultures 30 min prior to rSema4A addition. Similar to prior experiments, the relative number of Treg cells increased from 3.2 ± 0.4% in PBMC cultures with medium alone to 5.6 ± 0.2% by addition of rSema4A (Fig. 11A). The Plexin B1 Ab blocked this increase to 2.7 + 1.0%. (Fig. 11A). Therefore, neutralizing Plexin B1 receptor before rSema4A addition to PBMC cultures prevented the stabilizing effect of rSema4A on human Treg cells. Blocking of Plexin B1 before rSema4A applications decreases the relative numbers of Treg cells and IL-2 secretion in human PBMCs. Human anti–Plexin B1 blocking Ab was added to separate wells 30 min before rSema4A or irrelevant protein additions. 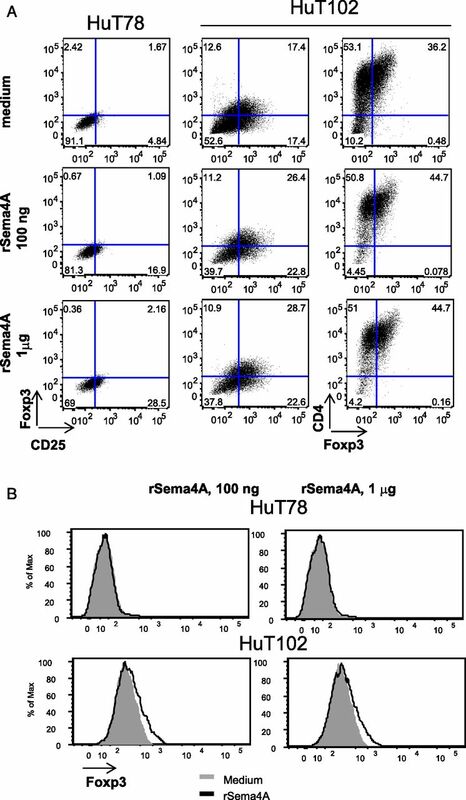 PBMCs were cultured with or without external rSema4A for 48 h. (A) The relative numbers of CD4+CD25highFoxp3+ cells were assessed in six flow cytometry settings for each cell culture condition, and the corresponding statistics were evaluated. (B) Cell culture supernatants from three separate experiments were assessed for the IL-2 content by sandwich ELISA. Note a positive correlation between an exogenous Sema4A dose and IL-2 production by PBMCs. Because the effect of rSema4A on stabilizing Treg cells appeared to be indirect, we hypothesized that rSema4A may stimulate PlexinB1+ cells to produce factors capable of enhancing Treg cell stability. Thus, we performed an analysis of the rSema4A effect on IL-2 secretion by PBMCs (Fig. 11B). We found that rSema4A enhanced the production of IL-2 in a dose-dependent manner. The effect of rSema4A on IL-2 content in cell culture supernatants was completely abrogated by the addition of anti-PlexinB1 Ab. In addition, anti-PlexinB1 Ab suppressed the basal levels of IL-2. In this report, we show that Sema4A exerts a Treg cell phenotype–stabilizing effect, defined as an increase in percentage and numbers of CD4+CD25+Foxp3+ cells, on CTLC, human PBMC populations, and CD4+ T cells. This Sema4A-dependent effect was mediated, at least in part, by Plexin B1 receptor because the observed Treg stability enhancement was suppressed by pretreatment of cells with Plexin B1–neutralizing Ab. We show in this study that Sema4A receptor Plexin B1 is expressed at different levels on HuT cell lines and all CD3+ T cells among PBMCs, including Treg cells. In contrast to mouse Treg cells, where NRP-1 expression has been shown to correlate with Foxp3 expression and Treg cell suppressive function (43), we did not find NRP-1 expressed on peripheral human T cells. It has been shown previously that HuT78 and HuT102 cells display a mature Th phenotype expressing CD3 (25, 26) and CD4 molecules (26) and secreting a variety of proinflammatory and Th-type cytokines (27). In this study, concomitantly with the previously defined T cell markers, we further examined HuT cells for the expression of the Treg cell marker Foxp3 (44). A previous study has demonstrated that CTCL adopts a suppressive Foxp3+ Treg cell phenotype after interaction with apoptotic CTLC cell–loaded DCs (45). The other molecules expressed by Treg cells, such as CD25 (46) and Helios (47), were also evaluated. Moreover, we were interested in another indirect Treg cell marker, namely NRP-1 (17, 43), as well as its ligand Sema4A (17), and the expression of another Sema4A receptor, Plexin B1 (48–51), on HuT cells and PBMCs. Indeed, we have found that HuT78 cells do not express intracellular Foxp3 molecules and have low levels of CD25 on the cell surface; however, their Helios and Sema4A expression was almost ubiquitous (Fig. 1A). In parallel with high Sema4A expression, HuT78 cells demonstrated low levels of its receptor Plexin B1. In contrast to HuT78 cells, around a third of HuT102 cells were stained positive for CD25 and Foxp3. Although CD25 expression on the same cell line varies between the cell harvests, the differences in its levels between HuT78 and HuT102 cell lines were always significant. With higher numbers of CD25-expressing cells among HuT102 cells we observe a higher Foxp3 expression. The variance in Foxp3 expression between primary adult T cell leukemia lymphoma cells and different adult T cell leukemia lymphoma cell lines has been reported previously (28). Low Sema4A expression on HuT102 cells was accompanied by high Plexin B1 expression (Fig. 1B), suggesting a lack of in cis Sema4A-PlexinB1 pathway stimulation. Irrespective of HuT cells, NRP-1 and NRP-2 detectable levels were not found. Our results are consistent with previous work indicating that the HuT78 cell line displays T effector cell–like phenotype, whereas HuT102 cells are Treg cell–like cells (28). Although the use of cell lines for research is a cost-effective tool considering their ability to proliferate indefinitely, there are caveats in extending findings to normal cells. It is appreciated that serial culture passaging of cell lines can induce genotypic and phenotypic variations. As an example, we observed variation in overall viability and CD25 expression on CD4+ HuT cells. Thus, the analysis of primary cells is more biologically relevant to human biology. The flow cytometry analysis of T cells from human peripheral blood of a normal donor demonstrated the expression of Plexin B1 (Fig. 2A). Treg cells among PBMCs were highly positive for this Sema4A receptor (Fig. 2B). We were unable to detect either NRP-1 or NRP-2 expression on human T cells and Treg cells (Fig. 2 and data not shown). We next examined the effect of rSema4A on HuT cell survival and on cell surface and intracellular marker expression. Addition of rSema4A even in a low dose (100 ng/1 × 106 cells) was sufficient to increase the HuT cell viability (Fig. 3). rSema4A stimulated an increase in the relative numbers of CD25-expressing cells for both cell lines (Fig. 4A, 4B). It is well documented that CD25 is expressed on both T effector and Treg cells, albeit at different levels (47), similar to what is reported in this paper for HuT78 (as T effector–like cells) and HuT102 (as Treg cell–like cells) cell lines where CD25 levels are higher on HuT102 (Figs. 1, 4). Surprisingly, high Helios-expressing HuT78 cells further upregulated this marker after exogenous Sema4A exposure, whereas it remained low in Foxp3+ HuT102 cells. HELIOS encodes the zinc finger transcription factor, which is important for lymphoid development (33, 51). Its dominant-negative isoforms, Hel-6, Hel-7, and Hel-8, are overexpressed in patients with acute lymphoblastic leukemia (52), which suggests that Helios plays an as yet undefined role in T cell malignancies. HELIOS gene expression in Treg cells is considered to be a Treg cell–specific but Foxp3-independent marker (53). Indeed, this difference in Helios expression was found in HuT cell lines where Foxp3-expressing HuT102 cells were low to negative in Helios expression (Fig. 1A, 1B, and data not shown). It is possible that distinct isoforms of Helios are present in HuT78 and HuT102 cells, which, in part, can explain its different regulation by rSema4A exposure. Being Helios-positive, HuT78 cells were negative for Foxp3 expression, whereas its low level was detected on ∼30% of HuT102 cells and was slightly increased by exogenous Sema4A (Fig. 5A, 5B). From the data presented in this paper it is clear that rSema4A exposure of HuT102 cells leads to increased yields of CD4+Foxp3+ and CD25+Foxp3+ Treg cells in cultures, which is not observed for HuT78 cells (Fig. 5A, 5B). As NRP-1 and -2 were not detected on either cell line (Fig. 1A, 1B) and this absence of expression was not affected by rSema4A exposure (data not shown), NRP-1 is likely not the functional sSema4A receptor for human Treg cells. Although we did not detect NRP-1 on human peripheral blood T cells, others have reported that human Treg cells express NRP-1 (17, 54). However, those NRP1+ Treg cells were located either in draining lymph nodes (54) or in umbilical cord blood (17) but not in the periphery, in adult human blood. Interestingly, the lymph node–derived NRP-1+ Treg cells expressed higher levels of Foxp3 as compared with NRP-1–negative Treg cells (54). Moreover, they also expressed other markers more characteristic of activated Treg cells such as HLA-DR, CD45RO, and GITR (glucocorticoid-induced TNF receptor). In addition, NRP-1+ Treg cells were functionally more active, more suppressive toward effector CD4+ T cell proliferation and cytokine production as compared with their counterparts lacking NRP-1 expression. As for cord blood–derived Treg cells, their originally low (around 7% of all sorted Treg cells) NRP-1 expression was expanded to 45% of cells after 8 d of anti-CD3 and anti-CD28 plus IL-2 in vitro stimulation (17). Thus, again, even cord blood Treg cells do not express much NRP-1 in steady-state condition. NRP1+ Treg cells were examined in patients with cervical cancer (54). The clinical management of cervical cancer includes chemoradiotherapy. Such treatment led to a depletion of NRP-1+ Treg cells in tumor-draining lymph nodes of patients, suggesting the association of tumor destruction with downregulation of these highly suppressive cells. The authors proposed two mechanisms of such Treg cell downregulation; one is related to a decrease in Treg cell–stimulating tumor-derived factors and the other is related to dying tumor cells being processed by DC, which then stimulate effector T cell responses. We further examined the effect of rSema4A on PBMCs, employing the same in vitro cell culture experimental design as for HuT cell lines. The rSema4A had no effect on the relative numbers of cells shown on CD3/CD4 dot plots with one exception for CD4+CD3− population (Fig. 6A), which was found to express Sema4A and its receptor NRP-1 (Supplemental Fig. 3). Previously, it has been shown that NRP-1 is expressed on the surface of human DC but not on monocytes (55). Its expression levels were increased with DC activation. Moreover, NRP-1 was also identified on human resting T cells. The importance of this bicellular expression in DC–T cell interaction and immune response initiation was established using Ab inhibition studies. CD4 was detected only on thymic and splenic mouse and rat DC (56) and never found on PBMC. Earlier studies, however, have reported CD4 expression on human monocytes and its positive effect on their Ag-presenting capacity (57). It is possible that NRP-1 expression on CD4intermed monocytes (Supplemental Fig. 3) could distinguish the strong Ag presenters. We show in this study that over 90% of CD3+ cells express Plexin B1 (Fig. 2A), suggesting that CD4+ T cells also express this Sema4A receptor. The role of Plexin B1 in CD4+ T cell differentiation and function has not been examined before, to our knowledge. Moreover, a novel Sema4A receptor Ig-like transcript 4 (ILT-4) has been recently cloned, and its functional activity on CD4+ T cells has been examined (58). Naive CD4+ T cells were cocultured with hSema4A-expressing L cells in the presence of T cell–activating factors, immobilized anti-CD3 and anti-CD28 Abs, or under Th1- or Th2-skewing conditions. In such cultures Sema4A stimulated strong Th2 cytokine production by activated CD4+ T cells. Thus, this recently discovered Sema4A receptor selectively enhances human Th2 cell activation. While examining asthmatic lung tissues, the authors noted high Sema4A expression on inflammatory cells, whereas CD4+ T cells within the lungs expressed ILT-4. These findings contrast with previously published research by Kumanogoh and colleagues (59, 60), which was first to define the Sema4A immunologic functions. The results of the latter studies defined Tim-2 as a stimulatory Sema4A receptor on murine CD4+ T cells. In contrast, a study by Rennert and associates (22) reported downregulatory effects of the Tim-2 pathway in asthma severity. Moreover, because Tim2-deficient mice demonstrated an enhanced lung Th2 inflammatory response to allergen challenge, it was concluded that Tim-2 is a negative regulator of Th2 responses (22). Additionally, the downregulatory effects of exogenous Sema4A in vivo in experimental models of asthma have been demonstrated (21, 61), and the results of the in vivo use of Tim-2 blocking Ab had proven that there is another Sema4A receptor contributing to the allergic inflammatory disease pathogenesis (21). As there is no human homolog for Tim-2 (58), currently only two Sema4A receptors were found to be expressed on human CD4+ T cells, namely ILT-4 and Plexin B1, with potential positive or negative regulatory effects on CD4+ T cells, respectively. We cannot exclude the possibility that soluble and membrane-bound Sema4A having distinct effects on T cell function through distinct counter receptors. We report in this paper that exogenous rSema4A had no effect on the total number of human T cells; however, the relative portion of Treg cells was potentiated by its exposure (Figs. 6, 7, 11). Moreover, as shown on Fig. 6B flow cytometry zebra plots for selected CD3+CD4+CD25+Foxp3+ cells, we observed a shift to a higher Foxp3 expression when rSema4A was present in cell culture medium. The increase in the relative portion of Treg cells elicited by rSema4A was suppressed by anti–Plexin B1 blocking Ab (Fig. 11). When CD4+CD25depleted T cells were stimulated in vitro in the presence of either TGF-β or IL-2 with or without exogenous Sema4A, we found a modest iTreg cell–inducing effect of Sema4A comparable to that observed in cell cultures with TGF-β (Fig. 8). However, IL-2 plus TGF-β cytokine combination was the most effective among stimulants used in CD25+Foxp3+ cell induction; a combination of Sema4A with IL-2 or with TGF-β did not reach these levels. The observed relative numbers of iTreg cells were comparable to those published before (41, 42, 62, 63). Future experiments will be necessary to determine if Sema4A-induced Foxp3 relies on FOXP3 gene enhancer elements overlapping with SMAD binding sites (64), as the degree of Foxp3 induction seen with Sema4A alone was comparable with TGF-β alone and the two were not synergistic. In conclusion, Sema4A stabilizes human Treg cell phenotype within cell lines, PBMCs, and CD4+ T cells, in part via interaction with Plexin B1. HuT cells lines may be helpful to analyze the Sema4A-PlexinB1 pathway in depth and to characterize signaling elements in both T effector and Treg cells. Further studies employing additional cell lines and primary cells from patients with asthmatic and other chronic inflammatory diseases are needed to confirm the Treg cell–stabilizing role of Sema4A and to define the mechanisms of such Sema4A action. 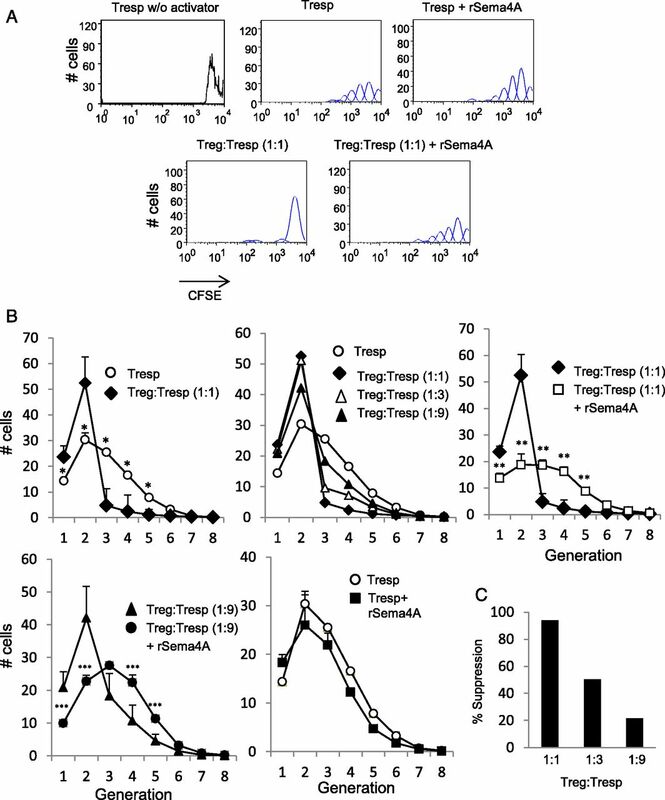 The absence of a direct Sema4A effect on Treg cell suppressive function in vitro (Fig. 10) suggests its mode of action may be complex. Paradoxically, we observed that rSema4A stimulated Tresp cell proliferation, but only when Treg cells were also present. Our preliminary studies suggest rSema4A can induce cytokines capable of stabilizing Treg cells, such as IL-2, which could also stimulate T cell proliferation in vitro. Future research in this area will help us to define the signaling elements involved in Sema4A effects on human Treg cells to establish the use of Sema4A pathway for the treatment of inflammatory diseases. We thank Dr. Scott Strome (Department of Otorhinolaryngology, Head and Neck Surgery, University of Maryland School of Medicine) for providing us with buffy coats of human peripheral blood from normal donors and Lisa Hester (The Cytokine Core Laboratory of the Center for Innovative Biomedical Resources, University of Maryland School of Medicine) for IL-2 measurements. This work was supported by National Institutes of Health/National Institute of Allergy and Infectious Diseases Grants R56 AI076736 and R01 AI076736, Merit Review Award I01 BX001850 from the US Department of Veterans Affairs Biomedical Research and Development Service (to A.D.K. ), Veterans Affairs Career Development Award CDA2/CX000649-01A1 from the Clinical Sciences Research and Development Service (to A.G.), and the Fondazione Piemontese per la Ricerca sul Cancro (Grant FPRC-5perMille-MIUR-2013 [to L.T.]).
. 2013. Cytokines in chronic respiratory diseases. F1000 Biol. Rep. 5: 3. 2012. Asthma phenotypes: the evolution from clinical to molecular approaches. Nat. Med. 18: 716–725. 2017. Innate and adaptive type 2 immunity in lung allergic inflammation. Immunol. Rev. 278: 162–172. 2017. Biologicals for asthma in patients with asthma-COPD overlap. Lancet Respir. Med. 5: 175–177.
. 2017. Mechanisms of immune regulation in allergic diseases: the role of regulatory T and B cells. Immunol. Rev. 278: 219–236.
. 2017. Omalizumab effectively protects against early and late allergic responses in asthma after 4 weeks. Allergy 72: 1912–1915.
. 2017. Prospects for new and emerging therapeutics in severe asthma: the role of biologics. Expert Rev. Respir. Med. 11: 505–512.
. 2016. A critical evaluation of anti-IL-13 and anti-IL-4 strategies in severe asthma. Int. Arch. Allergy Immunol. 170: 122–131. 2014. Allergic diseases and asthma: a global public health concern and a call to action. World Allergy Organ. J. 7: 12.
. 2003. Nasal tolerance induces antigen-specific CD4+CD25- regulatory T cells that can transfer their regulatory capacity to naive CD4+ T cells. Int. Immunol. 15: 731–739.
. 2002. Antigen-specific regulatory T cells develop via the ICOS-ICOS-ligand pathway and inhibit allergen-induced airway hyperreactivity. Nat. Med. 8: 1024–1032.
. 2016. Regulatory T cells in allergic diseases. J. Allergy Clin. Immunol. 138: 639–652.
. 2006. The role of the transcription factor Foxp3 in the development of regulatory T cells. Immunol. Rev. 212: 86–98.
. 2017. Polyclonal regulatory T cell therapy for control of inflammation in kidney transplants. Am. J. Transplant. 17: 2945–2954.
. 2017. Clinical-grade regulatory T cells: comparative analysis of large-scale expansion conditions. Exp. Hematol. 45: 27–35.e1.
. 2013. Stability and function of regulatory T cells is maintained by a neuropilin-1-semaphorin-4a axis. Nature 501: 252–256.
. 2018. Plasmacytoid dendritic cells protect from viral bronchiolitis and asthma through semaphorin 4a-mediated T reg expansion. J. Exp. Med. 215: 537–557.
. 2012. Neuroimmune semaphorin 4A downregulates the severity of allergic response. Mucosal Immunol. 5: 409–419.
. 2013. Neuroimmune semaphorin 4D is necessary for optimal lung allergic inflammation. Mol. Immunol. 56: 480–487.
. 2013. Neuroimmune semaphorin 4A as a drug and drug target for asthma. Int. Immunopharmacol. 17: 568–575.
. 2006. T cell, Ig domain, mucin domain-2 gene-deficient mice reveal a novel mechanism for the regulation of Th2 immune responses and airway inflammation. J. Immunol. 177: 4311–4321.
. 2005. Tim-2 regulates T helper type 2 responses and autoimmunity. [Published erratum appears in 2005 J. Exp. Med. 202: 877.] J. Exp. Med. 202: 437–444.
. 2008. p53-dependent and p53-independent activation of autophagy by ARF. Cancer Res. 68: 352–357.
. 1993. Regulation of CD3 expression in a protein kinase C isozyme-deficient T-cell line. Immunology 80: 654–657.
. 1996. T-cell lymphoma cell lines (HUT102 and HUT78) established at the National Cancer Institute: history and importance to understanding the biology, clinical features, and therapy of cutaneous T-cell lymphomas (CTCL) and adult T-cell leukemia-lymphomas (ATLL). J. Cell. Biochem. Suppl. 24: 12–23.
. 2016. Hypomethylation of the Treg-specific demethylated region in FOXP3 Is a hallmark of the regulatory T-cell subtype in adult T-cell leukemia. Cancer Immunol. Res. 4: 136–145.
. 2004. Plexin signaling hampers integrin-based adhesion, leading to Rho-kinase independent cell rounding, and inhibiting lamellipodia extension and cell motility. FASEB J. 18: 592–594.
. 2012. Suppression assays with human T regulatory cells: a technical guide. Eur. J. Immunol. 42: 27–34.
. 2014. Epigenetic modification of the FoxP3 TSDR in HAM/TSP decreases the functional suppression of Tregs. J. Neuroimmune Pharmacol. 9: 522–532.
. 2015. Differences in expression level of helios and neuropilin-1 do not distinguish thymus-derived from extrathymically-induced CD4+Foxp3+ regulatory T cells. PloS One 10: e0141161.
. 2018. Imaging flow cytometry: a method for examining dynamic native FOXO1 localization in human lymphocytes. J. Immunol. Methods 454: 59–70.
. 2009. The antiproliferative effect of kefir cell-free fraction on HuT-102 malignant T lymphocytes. Clin. Lymphoma Myeloma 9(Suppl. 3): S198–S203.
. 2010. Activity of deacetylase inhibitor panobinostat (LBH589) in cutaneous T-cell lymphoma models: defining molecular mechanisms of resistance. Int. J. Cancer 127: 2199–2208.
. 2011. Histone deacetylase inhibition modulates deoxyribonucleotide pools and enhances the antitumor effects of the ribonucleotide reductase inhibitor 3′-C-methyladenosine in leukaemia cells. Int. J. Oncol. 38: 1427–1436.
. 2017. ONC201 selectively induces apoptosis in cutaneous T-cell lymphoma cells via activating pro-apoptotic integrated stress response and inactivating JAK/STAT and NF-κB pathways. Oncotarget 8: 61761–61776.
. 2015. Helios, and not FoxP3, is the marker of activated Tregs expressing GARP/LAP. Oncotarget 6: 20026–20036.
. 2010. A role for the transcription factor helios in human CD4(+)CD25(+) regulatory T cells. Mol. Immunol. 47: 1595–1600.
. 2004. TGF-beta induces Foxp3 + T-regulatory cells from CD4 + CD25 – precursors. Am. J. Transplant. 4: 1614–1627.
. 2007. IL-2 is essential for TGF-beta to convert naive CD4+CD25- cells to CD25+Foxp3+ regulatory T cells and for expansion of these cells. J. Immunol. 178: 2018–2027.
. 2004. Neuropilin-1: a surface marker of regulatory T cells. Eur. J. Immunol. 34: 623–630.
. 2007. Human T-cell lines with well-defined T-cell receptor gene rearrangements as controls for the BIOMED-2 multiplex polymerase chain reaction tubes. Leukemia 21: 230–237.
. 2005. Cutaneous T-cell lymphoma: malignant proliferation of T-regulatory cells. Blood 105: 1640–1647.
. 2012. Defining a functionally distinct subset of human memory CD4+ T cells that are CD25POS and FOXP3NEG. Eur. J. Immunol. 42: 1893–1905.
. 2010. Sema4A induces cell morphological changes through B-type plexin-mediated signaling. Int. J. Mol. Med. 25: 225–230.
. 2011. Expression of neuroimmune semaphorins 4A and 4D and their receptors in the lung is enhanced by allergen and vascular endothelial growth factor. BMC Immunol. 12: 30.
. 2017. Semaphorins 4A and 4D in chronic inflammatory diseases. Inflamm. Res. 66: 111–117.
. 2001. CD4+CD25high regulatory cells in human peripheral blood. J. Immunol. 167: 1245–1253.
. 2003. Ikaros, Aiolos and Helios: transcription regulators and lymphoid malignancies. Immunol. Cell Biol. 81: 171–175.
. 2006. Foxp3-dependent and -independent molecules specific for CD25+CD4+ natural regulatory T cells revealed by DNA microarray analysis. Int. Immunol. 18: 1197–1209.
. 2008. Neuropilin-1 expression identifies a subset of regulatory T cells in human lymph nodes that is modulated by preoperative chemoradiation therapy in cervical cancer. Immunology 123: 129–138.
. 2002. A neuronal receptor, neuropilin-1, is essential for the initiation of the primary immune response. [Published erratum appears in 2003 Eur. J. Immunol. 4: 394.] Nat. Immunol. 3: 477–482.
. 1990. Antigen presentation by the CD4 positive monocyte subset. J. Leukoc. Biol. 47: 111–120.
. 2018. Human Semaphorin-4A drives Th2 responses by binding to receptor ILT-4. Nat. Commun. 9: 742.
. 2002. Class IV semaphorin Sema4A enhances T-cell activation and interacts with Tim-2. Nature 419: 629–633.
. 2005. Nonredundant roles of Sema4A in the immune system: defective T cell priming and Th1/Th2 regulation in Sema4A-deficient mice. Immunity 22: 305–316.
. 2013. An inhibitory role for Sema4A in antigen-specific allergic asthma. J. Clin. Immunol. 33: 200–209.
. 2004. Acquisition of anergic and suppressive activities in transforming growth factor-beta-costimulated CD4+CD25- T cells. Int. Immunol. 16: 1203–1213.
. 2008. Smad3 and NFAT cooperate to induce Foxp3 expression through its enhancer. Nat. Immunol. 9: 194–202.